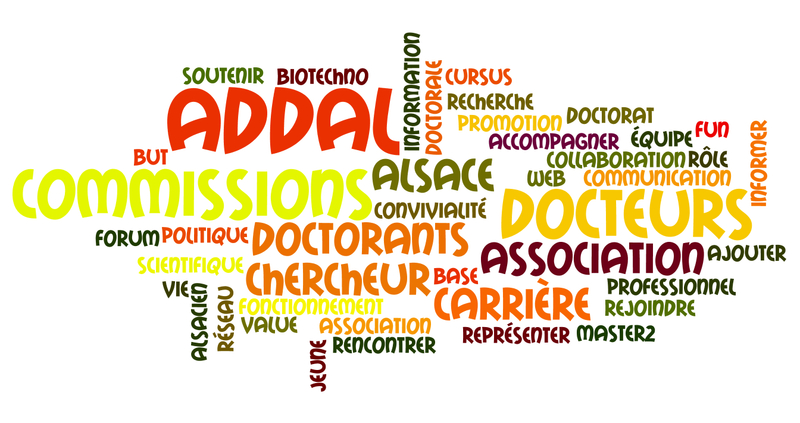 Since Addal was created in December 1998, the Association of Doctors and Doctoral Candidates of Alsace has guided, supported and praised /defended the cause of Early Stage Alsatian researchers wherever they are, and whatever they undertake. Defend material and moral rights of early stage researchers, and represent them in various administrative institutions. Support elected young researchers in the University council. Addal Board members meet every month to discuss and review previous Addal events, as well as ongoing and future ones. All members of the Addal association can attend these meetings and contribute if they wish to. We try to invite doctoral school representatives to attend the monthly meetings to encourage sharing and spreading of clear and concise information. Should you be interested in joining us in efforts, you are welcome to become a member of the association. Annual membership fee is 5€ per person. These funds are used to reduce the costs of our various actions and gain a better and wider scope and visibility and a larger awareness regarding young researchers. Our association is governed according to local law ( le droit local des association en Alsace-Moselle). Addal is funded mainly by the University of Strasbourg, which has always supported our association. Addal is ruled by the Statutes , and the internal regulations. Every year, the general assembly is organized, during which the new bureau representatives, comprised of members, are elected. The association des doctorants et docteurs d’Alsace.